» Percent carbon and nitrogen of leaves from shoots harvested at three levels in the canopy from 19 plots dominated by S. pulchra and B. nana shrubs near LTER Shrub plots at Toolik Field Station, AK the summer of 2012. The percent carbon and nitrogen from leaves of shoots harvested from 1m x 1m point frame plots the summer of 2012 at Toolik Lake, Alaska. were measured on a ThermoScientific 2000. For each point frame plot, six shoots were harvested from upper, middle, and low sections of the canopy. The photosynthetic capacity of each shoot was analyzed with a LiCor 6400 infra-red gas analyzer by being run through a light response and A/Ci curve. The area of the shoot as viewed from the stop of the LiCor opaque, confer chamber ("silhouette area") as well as the area of each shoot organ type was measured. These data are published separately, though methods are described below. The methods for setting up each point frame plot are described in both the "PinDropData" and "PF_LAI" datasets. The methods here describe how each shoot was harvested from the plots which were used for the point frame method. Six shoots were harvested from each of 19 1m x 1m point frame plots which were dominated either by Salix pulchra or Betula nana tall, shrub species. The "shoots" described here are branch clippings between eight to ten inches long. Whenever possible they were selected for appearing relatively healthy, intact leaves, and each shoot was taken from a different plant. As these shoots were used for shoot-level and leaf-level measurements, shoots with bi-furcated stems -- or two stems from the same branch/height were cut -- one for leaf-level and the second for shoot-level analyses. Before being cut, we measured the distance from the point frame to the highest tip on the shoot as well as the distance from the point frame to the shoot five inches from the tip. This way, we could approximate the angle of the shoot relative to the ground. Using the same criteria as for the pin-drop measurements, we measured the distance from the top of the shoot to the soil. In addition, the row number and pin-hole number nearest to the shoot's location with respect to the point frame was also recorded . We then measured the leaf area index (LAI) of the shoot by holding an LAI-2000 (Li-Cor Inc., Lincoln, Nebraska, USA) in the exact location where the shoot had been and taking the average of three readings (one above, three below). For these measurements we used the one-quarter cut out and took care to always hold the instrument level and with the technician's body casting a uniform shadow over the instrument's eye, with the technician standing between the instrument and the sun. On occasion when it was raining during the shoot harvest, the area near where the shoot had been was marked with flagging tape, and the the LAI measurement was taken at a later date, using the height from frame/distance from ground meausrements as well as the row number and pin hole measurements as a guide. Once cut, the shoot was placed immediately into water and transported to the lab. Once in the lab, the end of each shoot was clipped under water to ensure that there were no air bubbles in the stem that would inhibit the flow of water. Shoots were then allowed to sit at ambient room conditions (~20-25 degrees Celsius) until the the photosynthetic rates could be measured. 1. Arrange the shoot on a white background (e.g. blank paper or foam board) as it sat in the LiCor conifer chamber. Add a note of sample number and date. 2. Place a ruler that you can later use as a reference. Ensure ruler/stem do not overlap. 3. Use a tripod to hold the camera in a steady position and as close as possible to the stem, keep this distance constant throughout the samples if possible to avoid the need to re-calibrate Image J. 5. Download the images in the computer, save them as TIFF files. 1. Pluck the sample with forceps, arrange leaves, petioles, stipules, green and brown stems and inflorescences separately, grouped by type onto the white background of a plastic board. Place a ruler that you can later use as a reference. Add a note of sample number and date. 2. Press flat with the clear plastic cover. Ensure ruler/plant parts are not overlapping. 3. Place plastic side down on scanner (ensure no parts have overlapped when inverting plastic board). 4. Scan the images to the computer, save them as TIFF files. 6. Draw a new line and confirm that the measurement scale is correct. 10. Select the options of display masks and display results. Area of measured pixels is displayed. Check that only your leaf is included in the outline (not the ruler or extraneous tissue types). The data of the leaf area is displayed on a new window ‘summary’, this data can be copied into Excel or the data can be saved directly as an Excel file. Keep summary window open between picture analyses to maintain a record of measured areas. 11. Save new black and white image as well as its original colour photo with an appropriate file name. Once digital images of each shoot and tissue had been made, each plant tissue was separated, counted, and placed in a labeled coin envelope. These samples were then dried for a minimum of three days at 60 degrees Celsius prior to being weighed on a four-point balance with glass enclosure. Plant tissues were weighed in aggregate, thus the average mass included in these data are the total tissue mass divided by the count of that tissue (e.g. number of leaves, petioles, etc). In the same manner, plant tissure area was calculated in aggregate, thus the average area per leaf/petiole/stipule is based on the total area of that tissue divided by the count of that tissue. NOTE: The area used for correcting the LiCor A/Ci and light curve data included leaves, petioles, and stipules. Grinding: All leaf samples were dried in an oven at 60°C before grinding. Samples were small enough to grind the entire sample without subsampling. Leaves were ground using the Retsch MM 200 for 3 minutes or until a talcum powder consistency was achieved. Weighing: After grinding, samples were stored in glass scintillation vials and dried again at 60°C for at least 36 hours. Once samples were removed, vials were tightly re-capped. When not in use, vials were stored in dessicators. 3.5-4.5 mg of each sample was weighed into a 10x12 mm tin capsule. A standard calibration curve was created using increasing amounts of aspartic acid (from about 0.2 mg to 5.0 mg). A chemical standard, acetanilide, and an organic sample, apple leaf, were run after the standard curve. Every ten samples, an aspartic acid check standard and a duplicate of an already-packed sample were run. CN analysis: CN analysis was run between 10/4/2012 and 11/15/2012 by Rachel Rubin using the ThermoScientific 2000 at the Ecosystems Center, MBL, Woods Hole, MA. Duplicate sample values were averaged (mass, %N and %C) before inclusion into final results. The CHN data is available in the file "PF_CHN". 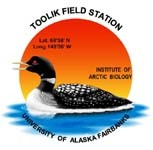 This was a season-long project, though it followed similar methods to ITEX projects performed starting in 2003 that are likely to be replicated in the future for reasearch at the Toolik Field Station, AK. Version 2: Updated metadata to newer version (with sites sheet). CH April 2013.